Solar Radio Astronomy in the "Valley of the Moon"
Radio JOVE goes live… and virtual! 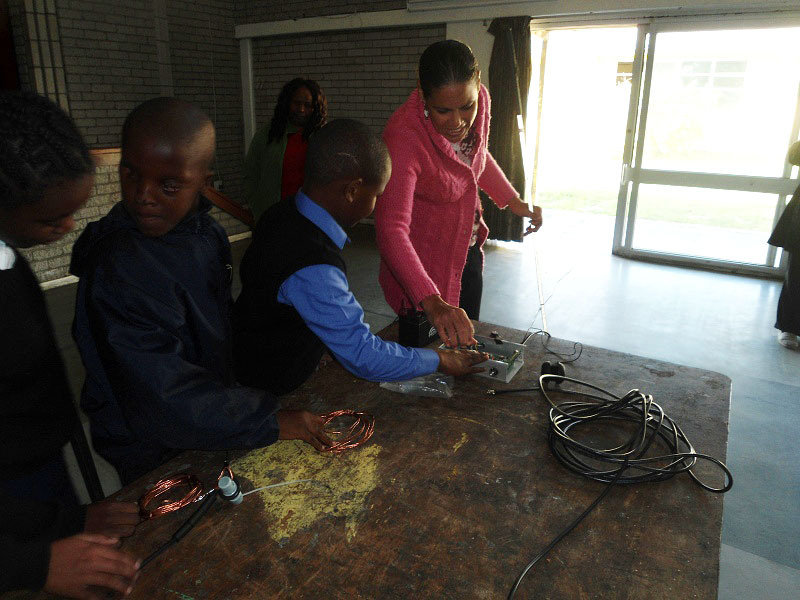 Dr. Wanda Diaz and a student from the Athlone School for the Blind examining a Radio Jove receiver. On March 24, 2015, members of the Radio Jove project participated in a special teleconference with students, staff members and guests at the Athlone School for the Blind in Cape Town, South Africa. Dr. Wanda Diaz Merced, Theodore Klink, Ramsamy Venugopal and Billy Donson facilitated the teleconference from South Africa leading a discussion with Radio Jove members Drs. Jim Thieman, Chuck Higgins and Francisco Reyes. Wanda Diaz Merced has led several efforts to promote interest in science and technology especially among students with visual impairments. Billy Donson is a teacher at the school and has taken an active role in promoting participation in activities for which visially impaired students have been underrepresented. The students do not have the opportunity to participate in science fairs for example. Often the mainstream public schools are involved in most of the science education so it is rare when an opportunity like this one becomes available to students at the school for the blind. Students from all grade levels participated in this teleconference. This experience provided them a unique opportunity to engage with professionals in the field and ask questions about science. For example, one student posed the question, "I heard about craft going to the moon and stars falling from the sky, what is it?". Their particiaption in this teleconference may encourage the students to pursue science. They realized that they can be involved with astronomy, and in particular radio astronomy, by listening to radio waves instead of physically seeing the objects. The students were very excited to participate in this exercise and I know they will never forget this experience. 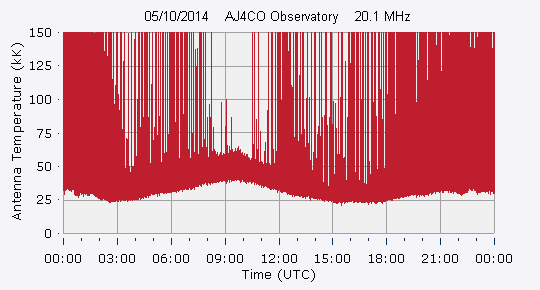 Last year the students had an opportunity to experience an operational Radio Jove system when Wanda Diaz installed an antenna at their school for a day (see figure below). 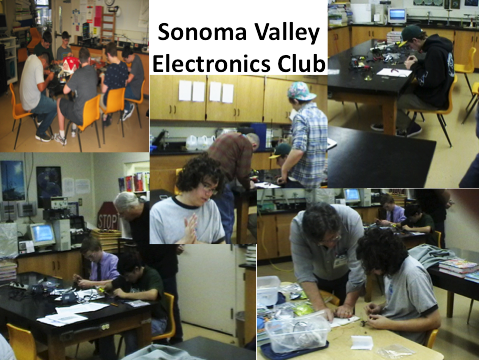 Right now they are getting ready to start soldering their own kit using a technique developed by Wanda Diaz and Leonard Garcia a few years back. This work will begin as soon as they obtain a "cold-heat" soldering iron. Their kit was donated to them by the Office of Astronomy for Development. Dr. Wanda Diaz demonstrating the Radio Jove system connected to a single dipole outside. The second dipole is on the table available for students to examine. Our story goes back to about 1990. 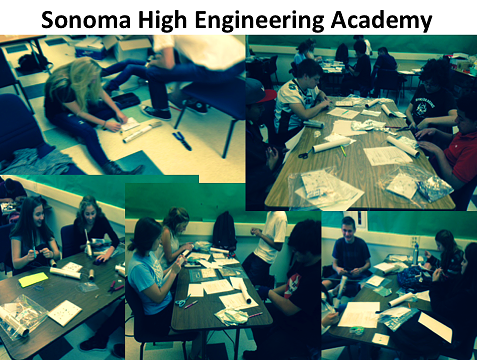 In the 1990’s our school (Sonoma Valley High School, in Sonoma, CA) had been involved in the INSPIRE project. Our involvement created many afternoon and late night adventures (some including camping) for the students in setting up radio equipment in the hills above Our Valley, where we monitored experiments with ion beams originating first with our Shuttle and then with the Russian Space Station, MIR. 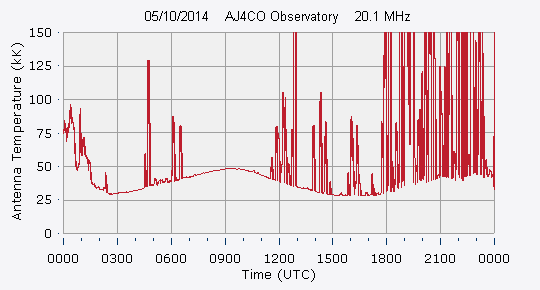 A bit more than 15 years ago we began using the Radio Jove system for monitoring Jupiter and the Sun. The students had built 4 of the Jove systems for the school and elsewhere. Although direct observational astronomy (including radio astronomy) at this point is not represented as a block of the curriculum, I use the Radio Jove system to illustrate many physics and chemistry concepts throughout the year. For the last 15 years, or so, I have used one of the 4 receivers at the school (where it operates regularly during school hours, and sometimes during the weekend) and one at the observatory (Robert Ferguson Observatory (rfo) in Sugarloaf Ridge State Park – one of three state parks in the “Valley of the Moon”), where I am a docent for solar radio astronomy. Originally, there was an issue letting someone into the building at rfo who did not do optical astronomy, so I was given a little area outside under a walkway during the first summer for public viewing days. (We have public viewing at least once a month, except in December, on a Saturday: solar, generally from 11am to 3pm, and in the evening is the star party, which can go late.) That Fall I was informed that the other volunteers were feeling bad, since I was sharing space with the scorpions and rattlesnakes (I am not sure who they were feeling bad for), so I was moved inside. Now we have 2 people that operate the radio at rfo: Keith Payea (who is far more knowledgeable about all things radio) and myself. Keith, a SARA (Society of Amateur Radio Astronomers) board member, recently introduced me to SARA activities, including the Western Regional SARA Conference. In March of this year, at this SARA conference, I presented things that our school is doing with radio, as well as a new (I think! ), and only partially developed and tested, idea for an inexpensive solar radio telescope, currently designed for solar 100.0 MHz reception. During the last two years, the students (in both the school’s Engineering Academy and the Electronics Club- see images) have been engaged in constructing two different aspects of this new system, including a scaled down dual dipole antenna and the use of Radio Skypipe. The next steps will be for the students to put these aspects together in a functional radio telescope, where they, themselves, can modify the design and check the effects of the modifications on reception, again using straightforward methods and equipment. This type of hands-on activity lends itself quite well to recent educational practices involving Common Core and Next Generation Science Standards. I am looking forward to moving ahead on this project. With the close of a Jupiter observing season, the questions is always, “okay, now what?” The end of the recent season is no exception. Here is an easy analysis of the galactic background, a fun experiment that can be done at any time by anyone with a Radio Jove telescope or similar equipment. The field of radio astronomy kicked off in 1933 with Karl Jansky’s discovery of galactic background emission at 20.5 MHz. He realized that a strong, constant source of shortwave radio static was moving across the sky every day – but not like the Sun. Rather, it moved like the stars – indicating the source was outside our solar system. Charged particles within our galaxy interact with the galactic magnetic field, in so doing emitting noise across most of the radio spectrum. This galactic background is easy to observe with a Radio Jove radio telescope. Since Earth lies within the galaxy, the Jove array’s beam sweeps across the plane of the galaxy twice a day as shown in Fig. 1. As Earth's rotation sweeps the beam across the portion of the galactic plane nearest the galactic core, a broad hump-shaped peak is generated in the strip chart trace. This is called, naturally enough, the galactic hump. Twelve hours later (or earlier), the beam sweeps across the portion of the galactic plane towards the outer rim of the galaxy, whereupon a much smaller hump is produced in the chart. These humps are most easily visible when they happen in the middle of the night. Figure 1 – A relatively clean record of the galactic background emission observed by Wes Greenman on Dec 31, 2009 at 22 MHz. Strip charts made in this part of the radio spectrum almost never look this nice for an entire day. The galactic hump in this figure is centered at about 1700 UTC. The spiky features are likely all local intereference. Using the Radio Jove receiver and the Radio Sky Pipe (RSP) software, record data in continuous 24-hour runs over the course of a year. This can be done every day, or just once a month. If a day is missed, simply record the following day. A few days either way each month won’t make any difference. Indeed, this may be necessary to escape periods of strong interference. Once the data has been recorded, the next step is to do some data smoothing to knock down the worst of the interference as shown in Figs 2A and 2B. This makes the galactic hump easier to see. Figure 2A – A typical 24-hour strip chart prior to averaging, complete with real-world interference. Figure 2B – The same data shown in Fig 2A after application of smoothing by averaging using a 3,000 sample (five minute) window. Some of the interference has been knocked down. RSP can do this in review mode. Load a file for review, then go to the Tools menu item and select Smooth by Averaging. After the data has been smoothed, the next step is to save some graphics of the strip charts. One can then see the galactic hump move from right to left as the galactic core transits earlier each day due to Earth’s orbit about the Sun – the shift is about two hours earlier per month. This motion is explained well in Listening to Jupiter by Flagg. To make Fig 3, some sky maps from Radio Jupiter Pro can be placed next to the strip charts, then the whole stack of images may be converted to an animated GIF using Photoshop. This is a good summer project despite summer lightning storms as the inner galactic plane transits early in the morning local time. Nevertheless, treat lightning with respect: when you hear distant thunder, it is good practice to disconnect the antenna from the receiver before lightning arrives in your area. Never disconnect the antenna cable during local lightning lest your body become a path to ground. Figure 3 – Animation of twelve months of 24-hour strip charts, one frame per month. The galactic hump moves right to left due to Earth’s orbit, appearing two hours earlier each month. 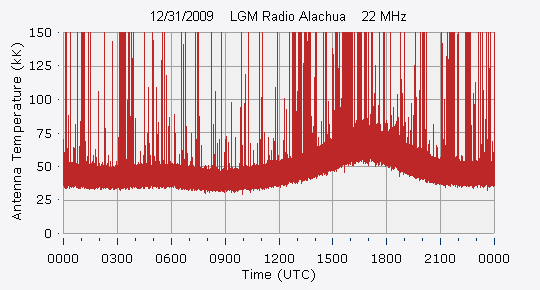 The images at the right were generated using Radio Jupiter Pro and represent the sky as seen from High Springs, Florida at 0730 UTC (the blue marker on the horizontal axis of the strip chart) on the date of the associated strip chart. The orange numbers in the sky view lie along the galactic plane and represent galactic longitude where 0° is the galactic core. Jupiter will be a hot topic for planetary scientists in the next couple of years with the NASA/JUNO mission, now heading towards Jupiter. The spacecraft will start Jovian observations in early 2016. This is a unique opportunity for Radio JOVE enthusiasts to share their data and have them chewed and digested by real rocket scientists. With its global longitude coverage the Radio JOVE network can be particularly helpful. Last year, the Radio JOVE team and the Observatoire de Paris (France) have started a partnership to set up a Radio JOVE database using standard scientific data access software. This so-called Virtual Observatory (VO) is enabling easy data sharing and efficient data queries. The team will use the European Union-funded VESPA (Virtual European Solar and Planetary Access) infrastructure. The French Nançay Decameter Array is already shared using this framework. The Radio JOVE data will then be available as easily as those professional resources, using the same research tools. Two types of receivers are used in the Radio JOVE project: the classical single frequency radio kit (tuned around 20.1 Mhz), and wide band analyzers covering a typical range of 15 to 40 MHz. There are many narrow-band analyzers and a few wide-band ones. The interest of the wide band data is scientifically obvious, as it directly compares with professional radio instruments. The narrow-band data can also be used, but an assessment of the data usability is on-going by scientists in Obervatoire de Paris. 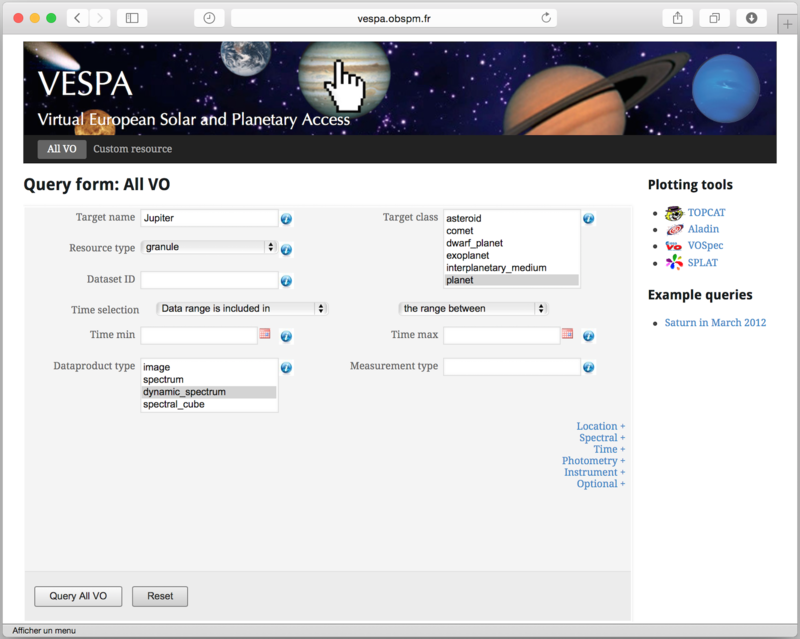 Figure 1 – This web-based form (available at http://vespa.obspm.fr) is being used to search for data using physical parameters such as: time range, spectral range, data type, target name, etc. Currently 14 data repositories are connected in VESPA, while 6 are under development, including Radio JOVE and Iitate Radio Observatory in Japan. 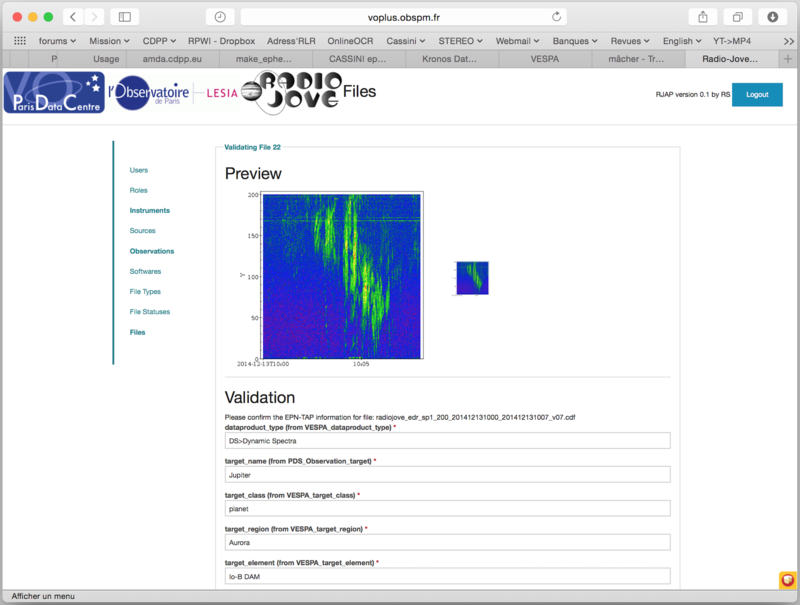 The Radio JOVE data are currently submitted to the RadioJOVE archive in various formats not all of which are directly usable by the scientific community. Most of the shared data is distributed as screen shots. The narrow-band data providers are also sharing data files in WAV or MP3 formats. These data formats don’t include any metadata, which makes it very difficult to evaluate the provenance and the relevance of the data. Data sent by Radio JOVE observers using the direct output binary format from the RadioSkyPipe software are better, but such data still needs to be transformed into a standard science format. The Paris team has built a data format translator that produces CDF (Common Data Format files, including additional metadata). CDF was developed by NASA/Goddard Space Flight Center teams for space physics data archiving. Those files are compliant with NASA standards and thus could be archived in NASA data centers eventually. Figure 2 – Dave Typinski’s data showing Jovian decametric emissions and modulation lanes converted into CDF and loaded into a professional astronomical tool named TOPCAT (developed in Bristol, UK). 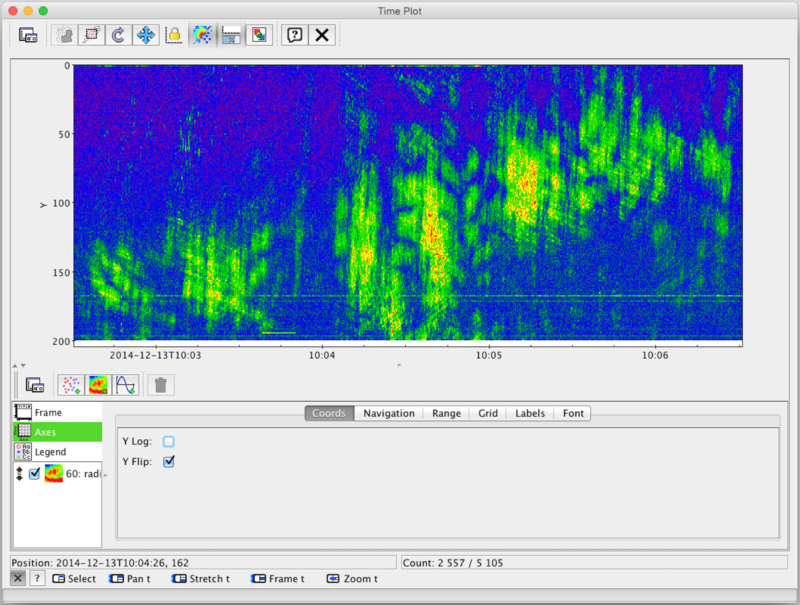 Figure 3 – Same data showed during the validation process with the new RadioJOVE archive prototype. The Paris and Radio JOVE teams are now working on a new Radio JOVE archive service, with an online submission form for data providers. A panel of validators will review the submitted data. This step is required for ensuring the data is scientifically valuable. During the processing pipeline, data previews are computed on the fly. The data is publically available in VESPA immediately after the data validation. A more detailed description of this new service will be published in a future Radio JOVE bulletin. Links with the VWO (US-based Virtual Waves Observatory) will also be studied. Editor's Note: For more information on this project including links to presentations and reports please visit the MASER web site.